For other songs of similar name, see Jolene. "Love, You're So Beautiful Tonight"
(1973) "I Will Always Love You"
"Jolene" is a song written and performed by American country music artist Dolly Parton. It was released in October 1973 as the first single and title track from her album of the same name, produced by Bob Ferguson. The song was ranked No. 217 on Rolling Stone magazine's list of "the 500 Greatest Songs of All Time" in 2004. 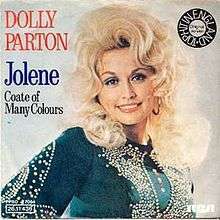 According to Parton, "Jolene" is the song most-recorded by other artists of all the songs she has written. "Jolene" tells the tale of a woman confronting Jolene, a stunningly beautiful woman, who she believes is trying to steal away her lover and begging her "please don't take my man." Throughout the song, the woman implores Jolene "please don't take him even though you can". According to Parton, the song was inspired by a red-headed bank clerk who flirted with her husband Carl Dean at his local bank branch around the time they were newly married. In an interview, she also revealed that Jolene's name and appearance are based on that of a young fan who came on stage for her autograph. The song became Parton's second solo number-one single on the country charts after being released as a single in late 1973 (prior to the album's release). It reached the top position in February 1974; it was also a moderate pop hit for her and a minor adult contemporary chart entry. The song has sold 733,000 digital copies in the US since it became available for digital download. The song was released as a single later in the UK, and became Parton's first top ten hit song in the country, reaching number seven in the UK Singles Chart in 1976. The song also re-entered the chart when Parton performed at the Glastonbury festival in 2014. The song has sold 214,279 digital copies in the UK as of July 2014. "There's No Home for You Here"
(2004) "Jolene (Live Under Blackpool Lights)"
"Jolene (Live Under Blackpool Lights)" was released as a live single by American garage rock band The White Stripes. The single reached No. 16 in the UK Singles Chart in November 2004. The White Stripes previously released a studio version of "Jolene", as the B-side to their 2000 single of "Hello Operator", from the album De Stijl. In Australia, the song was ranked No. 10 on Triple J's Hottest 100 of 2004. Another live performance of the song is featured on the 2010 live album Under Great White Northern Lights. The White Stripes' version was voted one of the greatest live covers by readers of Rolling Stone magazine. Jolene the 8th track on the Livin' For The Summer album released August 2015. This is the male version done in a country ballad style. Olivia Newton-John's version of "Jolene" is featured on her 1976 album Come on Over. Newton-John's version was released as a single in Japan. Leila Forouhar, the Persian pop star, has covered this song in her album called Do Parande (The Two Birds, Persian: دو پرنده‎‎) in 1976. She is one of the first popular singers that has sung "Jolene". Scottish female pop group Strawberry Switchblade released an electro-pop version as a single in the UK and Japan in 1985, and it was later included on an expanded edition of their 1985 s/t album. Darcy Clay included a cover version of the song on his 1997 EP Jesus I Was Evil. British alternative rock group Queenadreena has covered the song in 2000. Sherrié Austin's version of "Jolene" is the second track on her 2001 album Followin' A Feeling. Mindy Smith covered "Jolene" in 2003, both for her debut album One Moment More and the Dolly Parton tribute album Just Because I'm a Woman. Parton described this cover as her favorite version of the song. The version with Mindy Smith was performed on stage with Dolly Parton, who is also featured in the official music video. Norwegian duo Susanna and the Magical Orchestra covered the "Jolene" in 2004 for their debut album List of Lights and Buoys. The punk cover band Me First and the Gimme Gimmes cover the song on their sixth album Love Their Country, released in October 2006. British singer Sophie Ellis-Bextor covered the song in 2008, and it was used on the new BBC series Beautiful People. Ellie Goulding covered this song in 2009. In 2012, Miley Cyrus (Parton's goddaughter) performed a version in a "Backyard Sessions" video found on Cyrus' official website which gained some attention. On August 12, 2013, during the fifth season of The X Factor Australia Dami Im covered "Jolene" during Super Bootcamp but forgot the lyrics. Although she did complete the track, she was eliminated from the competition. Just prior to the Home Visits round, another contestant pulled out, and Im was invited back to resume the competition. She eventually went on to win the series and received a contract with Sony Music Australia. Im has released an acoustic version of the song. Katy B sang the song live on Zane Lowe mixed with her song "Aaliyah" in 2014. The Sisters of Mercy often covered this song in concert as part of a series of tasteful but goth-"uncool" covers to provoke the audience. It can be heard on their live bootleg Amphetamine-Boeblingen. Laura Marling has covered this song with Mumford & Sons. Dutch singer Anneke van Giersbergen, former member of the Dutch band The Gathering, has covered this song, a few times, live on stage. In addition to the above, "Jolene" has been performed by numerous performers, including the Finnish singer Vicky Rosti in 1976, Dutch singer Patricia Paay in 1977, Natalie Merchant, 1980's new wave group Rubber Rodeo (1981), Keith Urban, The Weepies, Jill Johnson on the 2007 album Music Row, Reba McEntire, Katie B, Sherrié Austin, Rhonda Vincent, the Geraldine Fibbers, Lacrimosa, Queen Adreena, Ashley Arrison, Alison Krauss, dance music act One Dove, the Macedonian-German singer Alexander Veljanov, the Japanese bubblegum pop trio Candies, Norwegian singer Elisabeth Andreassen in 2004, and Irish American musician Moira Nelligan. The song was frequently covered in reality singing competition. On American Idol, the song was covered by Brooke White, Alexis Grace, and Jessica Meuse. It was also covered in the third season of Australian Idol by Klancie Keough. Las Chicas Del Can covered this song in the 1980s. The Chilean cumbia compositor Paskual Ramirez made a 'Spanish-translated' cover with cumbia rhythms, partially based on the translation made by Las Chicas del Can for the LP: Fantasía Vol. 1 (1991) and a techno-cumbia re-arrangement of the cover for the disc Paskual y su Alegría – Internacional (2000). His mate Claudia sang in the first version and his daughter Eva sang in the 2000s rearrangement. A 1994 version by Swedish show group Spirella Girls was named "Brolin, Brolin" and was about Swedish soccer player Tomas Brolin. "Jolene" was remixed as a dance track by Money, a dance group offshoot of British group James in the late 1990s. The lyrics were a sample from Parton herself, with new vocals (explaining the man in the song's point of view), by Saul Davies. In 2003, as part of an episode of CMT Crossroads, the song was performed as a duet by Parton and Melissa Etheridge, with Etheridge taking lead vocals. In 2006, the song also appeared in Back To Mine, a mix album mix by Liam Howlett. The song was parodied by Australian satirical comedy show The Chaser's War on Everything. The title was altered to "Pauline" in a reference to former One Nation Party leader Pauline Hanson. In 2008, Icelandic artist Lay Low covered this song for the Ökutímar soundtrack. She later recorded a live version for her 2012 album Live at Home. In 2010, Parton's original version was featured and performed by Jessica Lowndes as Adrianna Tate-Duncan in the 90210 episode "What's Past is Prologue". In 2011 was also played at some concerts of Fiona Apple. In 2011, John Mayer, Keith Urban, and Norah Jones performed the song at the Grammy Awards as a tribute to Dolly Parton. Vicci Martinez covered the song on The Voice. In 2011, Samuel Larsen performed this song in the finals of Oxygen's reality competition series The Glee Project. Larsen won the competition along with a fellow contender. It was performed on the show Glee by Dot Marie Jones who portrays Coach Beiste in the episode "I Kissed a Girl". The episode aired on November 29, 2011. In 2012, The Little Willies covered the song on their album For the Good Times with Norah Jones on lead vocals. In 2012, Brandi Carlile covered this song on her Bear Creek tour. In 2012, Sandra van Nieuwland, a Dutch singer, covered this song for her album And More. In 2013, Straight No Chaser, an a cappella group from Indiana, covered this song (with featured vocalist Dolly Parton herself) on their 2013 album Under the Influence. In 2013, YouTube user goodlittlebuddy's slowed-down version of "Jolene" rose to internet fame. The song was played at 33RPM instead of 45RPM, which represents a 25% slow down from the original. This version was featured during season one of the NBC television series The Blacklist. In July 2014, Tori Amos covered the song on her Unrepentant Geraldines Tour. In 2014, Natalie Bream covered the song, by changing the lyrics from "Jolene" to "Fleur Bream", who is Bream's pet cat. The cat Fleur has gained notoriety, by starring in hit soap Emmerdale. In March 2015, the song was parodied in the fourth episode of Community by changing the lyrics from "Jolene" to "Gay dean". In July 2015, a parody version aired on Austria's alternative radio station FM4, sung by the two radio show hosts Hannes Duscher and Roland Gratzer. The title was changed from "Jolene" to "Nadine", and the changed song lyrics are sung in German from Austria. This version became quite popular in Austria during the summer. In August 2015, Dutch tech-house producer and DJ Ferreck Dawn made a modern-day cover of "Jolene". In December 2015, the German band The BossHoss and the Dutch band The Common Linnets made a country music cover of "Jolene". In September 2016, the American a cappella group Pentatonix released a cover of the song with Dolly Parton herself as feature artist. Kirsty Maccoll's 1994 single "Caroline" is in-spirit response song to "Jolene," in which the Jolene character cannot face her best friend (the titular Caroline) after having an affair with Caroline's husband. In 2011, Estonian indie-rock band Ewert and the Two Dragons released an answer song, also titled "Jolene," in response to the original recording. In this version, Parton's "man" directly addresses Jolene, telling her that nothing will ever happen between them and that his current lover would fight to get him back. In 2013, country singer Jennifer Nettles recorded "That Girl," which she stated in interviews should be subtitled "The Ballad of Jolene." The song is written from the perspective of the Jolene character, who Nettle feels is unfairly maligned in the original song. In this version, the other woman is shown to have no interest in taking the singer's man and in fact warns the Parton character that "her man" is attempting to cheat with her. In 2013, The Beautiful South guitarist David Rotheray recorded an album of answer songs, among which is "Jolene's Song," performed by Julie Murphy. This version of Jolene is equally heartbroken to learn that the man who loves her belongs to another woman and expresses her pain at being framed as a heartless temptress by the original song. "That Girl", a song by Jennifer Nettles that serves as a lyrical counterpart to "Jolene"
↑ "The RS 500 Greatest Songs of All Time". Rolling Stone. 2004-12-09. 1 2 3 "Dolly Parton's 'Jolene' Still Haunts Singers". NPR. October 9, 2008. ↑ Simon Usborne (July 1, 2014). "Glastonbury 2014: So who's Jolene?". The Independent. ↑ Bjorke, Matt (November 8, 2016). "Top 30 Digital Singles Sales Report: November 8, 2016". Roughstock. ↑ Liv Moss (June 27, 2014). "Dolly Parton's Top 10 most downloaded tracks of all time revealed!". Official Charts Company. ↑ "Country Bites News snippets June 30 - July 6, 2014". Country Routes News. 13 July 2014. ↑ "Top Singles - Volume 21, No. 3, March 02 1974". RPM. Collectionscanada.gc.ca. Retrieved 30 October 2012. ↑ "Adult Contemporary - Volume 21, No. 2, February 23, 1974". RPM. Collectionscanada.gc.ca. Retrieved 30 October 2012. ↑ "Country Singles - Volume 21, No. 1, February 16, 1974". RPM. Collectionscanada.gc.ca. Retrieved 30 October 2012. ↑ "Danishcharts.com – Dolly Parton – Jolene". Tracklisten. ↑ "The Irish Charts - Search the Charts - Jolene". Irish Recorded Music Association. Irishcharts.ie. Retrieved 30 October 2012. ↑ "Swedishcharts.com – Dolly Parton – Jolene". Singles Top 100. ↑ "Archive Chart: 1976-06-19" UK Singles Chart. ↑ "Dolly Parton – Chart history" Billboard Hot 100 for Dolly Parton. ↑ "Chart Search Results - Adult Contemporary 1974-02-23". Billboard.biz. Retrieved 30 October 2012. ↑ "Dolly Parton Awards". Allmusic. Retrieved November 2, 2012. ↑ "Cerificeringer" (in Danish). IFPI Denmark. Retrieved 30 October 2012. ↑ "Readers' Poll: The Greatest Live Cover Songs". Rolling Stone. ↑ "Strawberry Switchblade - singles discography". StrawberrySwitchblade.net. Retrieved 26 May 2011. ↑ "Jolene: Me First and the Gimme Gimmes". RockPeaks. ↑ Marc Malkin. "Miley Cyrus Cover Songs: Dolly Parton's"Jolene" Isn't the Only One". E Online. 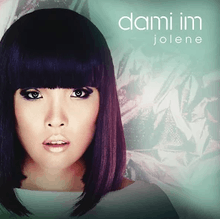 ↑ "Dami Im Sings 'Jolene' on The X Factor Australia 2013 Bootcamp". ↑ "Minogue gets vocal about Dami". ↑ "X Factor Australia Grand Final: Dami Im completes demolition with army". ↑ "Dami Im - Jolene (Acoustic)". ↑ Music row / Jill Johnson, Svensk mediedatabas. Retrieved 9 September 2011. ↑ "Jolene (featuring Dolly Parton)". www.sncmusic.com. Retrieved 3 August 2013. ↑ Cinquemani, Sal (August 21, 2014). "The 10 Best Cover Songs from Tori Amos's Unrepentant Geraldines Tour". Slant Magazine. Retrieved August 22, 2014. ↑ "Nadine". Retrieved 9 October 2015. ↑ "Jolene (feat. Dolly Parton) - Single by Pentatonix on Apple Music". Itunes.apple.com. 2016-09-16. Retrieved 2016-10-08. ↑ "ARIA CHART WATCH #387". auspOp. September 24, 2016. Retrieved October 1, 2016. ↑ "Pentatonix – Chart history" Canadian Hot 100 for Pentatonix. Retrieved October 3, 2016. ↑ "NZ Heatseekers Singles Chart". Recorded Music NZ. September 26, 2016. Retrieved October 1, 2016. ↑ "Archive Chart: 2016-09-23". Scottish Singles Top 40. Retrieved October 1, 2016. ↑ "Pentatonix – Chart history" Billboard Bubbling Under Hot 100 for Pentatonix. Retrieved October 1, 2016. ↑ "Pentatonix – Chart history" Billboard Hot Country Songs for Pentatonix. Retrieved October 1, 2016. "Can't We Talk It Over in Bed"
"No Matter What You Do"
"I Honestly Love You (1998 version)"
"When You Wish upon a Star (2011 version)"
"Magic (Peach & Murphy remix)"
"The Big Three Killed My Baby"
"Lord, Send Me an Angel"
"You Don't Know What Love Is (You Just Do as You're Told)"
"300 M.P.H. Torrential Outpour Blues"